One of our highly utilized vm is giving the error that there is no more space for the the vmdk shown in the following image. The VM won't start because of this issue, so I'm not able to delete data from the volume at OS level. Storage vMotion some of the other VMs off this Data Store. The ultimate goal is to free up space on the DataStore so you can unfreeze VM. And by the way - freeing space from the OS level won't help you. If your vmdk is thin - it will grow in size over time, but will not shrink when you clean underlying OS. There are some tricks to reduce vmdk size again available, but those require bringing VM down (not online process). Delete some old log files. I see that you have over 2GB in logs in that one folder alone. You may find that shutting down some VMs will free up some space taken by the *.vswp files, while they are shut down. What Dmitry Zayats suggests about extending the datastore to make it bigger or moving other VMs off that datastore. 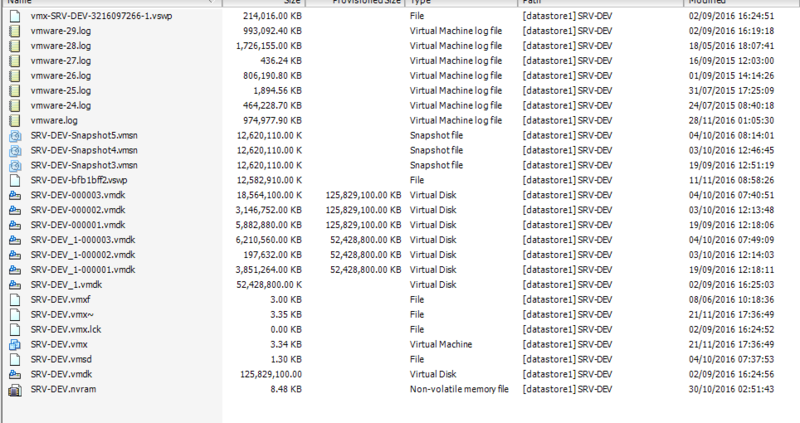 If all else fails, move the VM to a datastore with enough space, then see if you can get rid of the snapshots. Note that since the machine is not running you can use a few different methods of moving the VM. Try the "Delete All" button in the snapshot manager instead of consolidate. Note: Deleting data at the guest OS level will likely only make the snapshot files bigger, as it makes the snapshots more different to the previous snapshot than before. Not the answer you're looking for? Browse other questions tagged virtualization vmware-esxi virtual-machines vmware-esx or ask your own question. vmware esxi 5, cant create snapshots and consolidate fails, how to delete old or consolidate redo logs? How do I delete ESXi vm snapshots using the least additional space possible? Is it safe to delete this snapshot?